I spent this past weekend at the Venetian Hotel Las Vegas with my brother and a friend. We were in town for the University of Minnesota and UNLV football game. 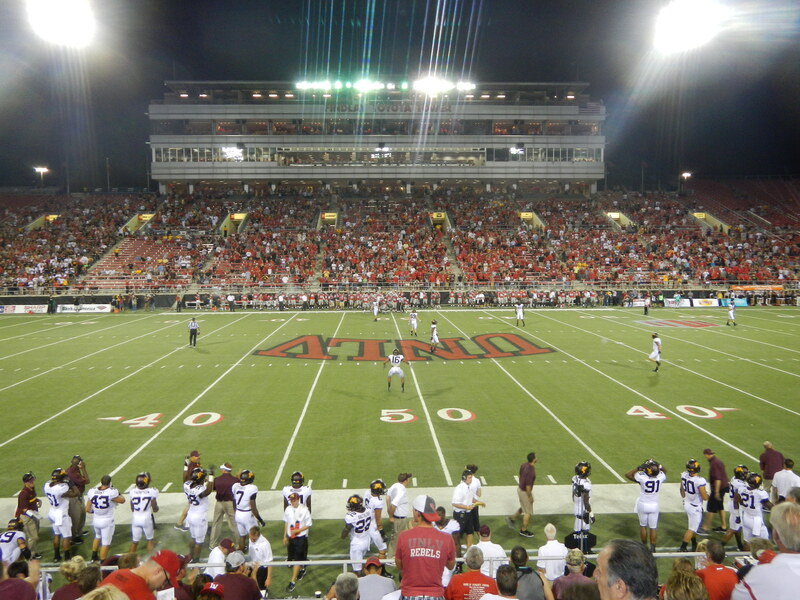 We got a good deal on a rental car, so made the drive out from The Strip to Sam Boyd stadium Thursday night. We had been planning for years to travel to Las Vegas to see the game and party the nights away. And while we don’t necessarily spend a lot of time in our room while in Vegas, a hotel room can make or break a fun getaway; we’ve suffered through plenty of cheaper places and wanted to do it up this time. 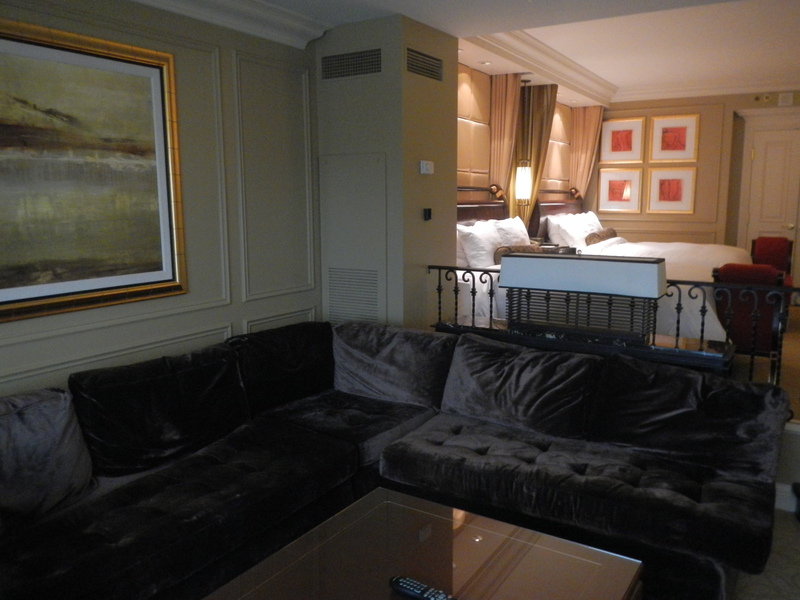 So after a great deal of discussion, we happily and finally settled on the Bella Suite at the Venetian Resort and Casino. 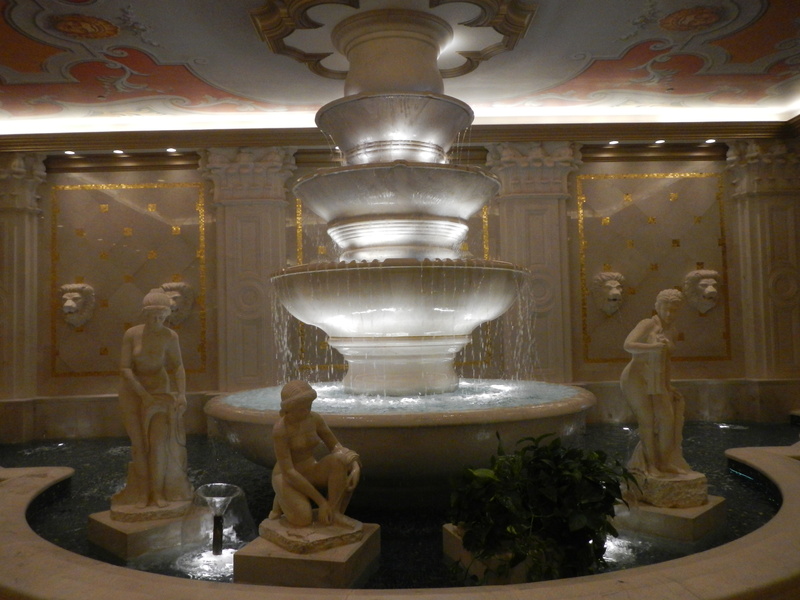 My jaw dropped when I walked into the Venetian Resort and Casino’s lobby to check-in. I had forgotten how finely decorated it was, particularly the beautifully painted ceilings. It had been years since I had been in there, since, to be quite honest, I had never before cared for the Venetian. The staff always seemed snotty, the table limits too expensive, and the atmosphere not to my liking. But that opinion changed within the first hour of our stay. We checked in, made it up to our room, and had to sit and wait for our bags. And wait. And then wait some more. We were told they were on their way, but it took over an hour – for a reason I still don’t totally understand – to bring them up. But with a simple complaining phone call, our resort fees, more than $60 in total, were washed away to make it right. 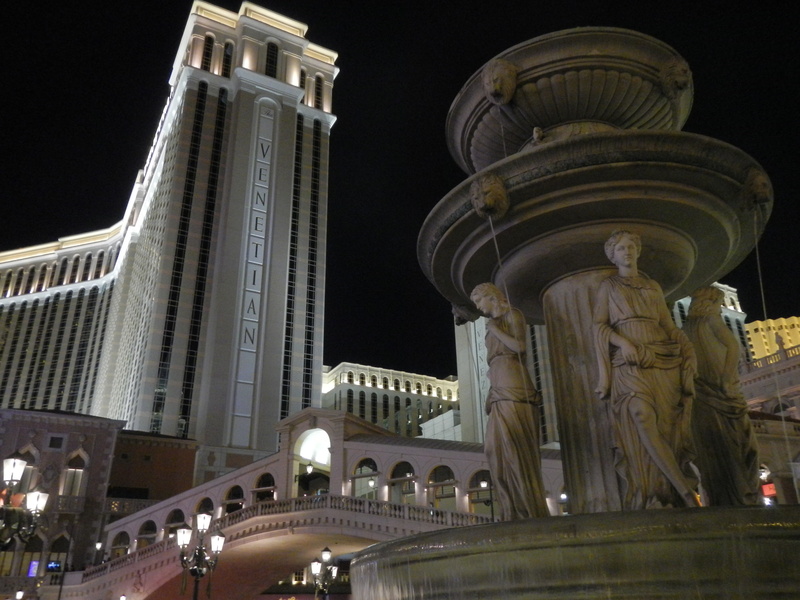 In the grand scheme of things, $60 is not a lot of money – especially for a place like the Venetian. So it is easy for them to waive such a paltry sum and make a guest happy in the process. The customer service gesture went a long way with me. And throughout our weekend we experienced a lot of great customer service from employees in all parts of the resort and casino. It didn’t matter what their job was – food service employee, dealer, or valet – everyone was quite friendly and happy to help us. And so my opinion on the snotty staff changed. 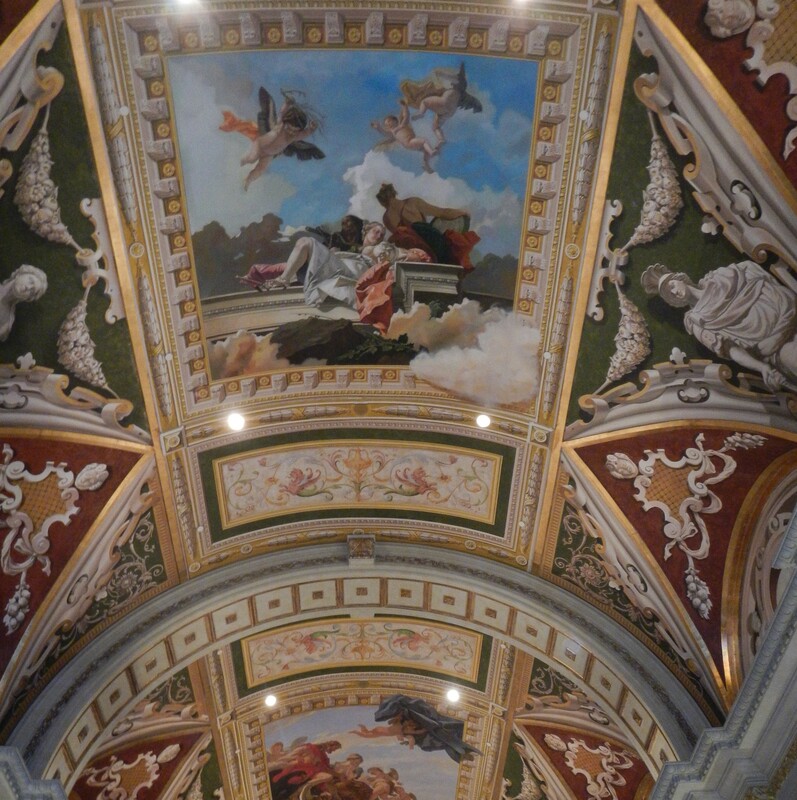 The Venetian Resort and Casino is magnificently decorated as only the top properties are in Las Vegas. Along with its convention center, it is part of the largest five-diamond hotel and resort complex in the world. The hotel tower rises 475 feet above Las Vegas Boulevard, a total of 36 stories containing 4,049 suites. I admired as much of it as I could as I wandered throughout, but it is near impossible to explore all of its stunning frescoes, fountains, and other amazing features in one visit. 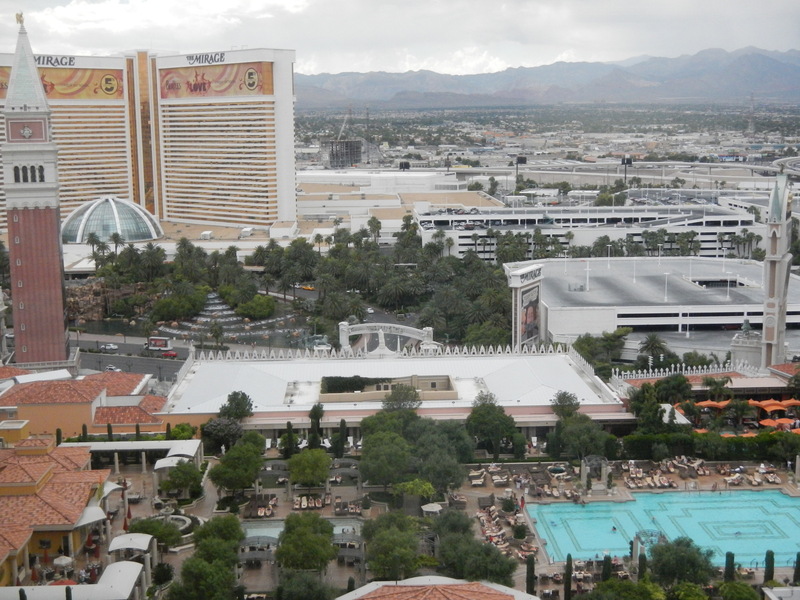 As I said, even though a lot of time is not spent inside the hotel room during a trip to Las Vegas, it can be a deal breaker for your vacation if it is dirty, stale, or poorly kept. Our suite, high up on the twentieth floor, instantly impressed. It was tastefully decorated, had more than enough space for three of us to sleep, and had a stunning view of the hotel’s pools and The Strip; we were even able to watch the free volcano show at the Mirage and see some fireworks from the Treasure Island show from the comfort of our living room. This isn’t to say the room was without fault, though. The most annoying problem was with the French doors leading into the bathroom. One door would not close unless the other was shut first, and that one stuck so you really had to yank to get it closed. While I liked how the bathroom was spacious with plenty of options – two sinks, a separate vanity, a stand-up shower and a tub – overall I did not like how it was laid out. The main problem beyond the French doors was that the toilet, which was in a separate room, was still only accessible by entering the bathroom. This caused a bit of dancing for me on my last morning, since I could not get in to use the bathroom while my brother was in the shower. The housekeeping staff did a great job cleaning the messes we left in the room. There were a few spots missed, though, over the long term. I could tell the sofa was obviously well used, since there were marks in spots that either needed repairing or replacing. 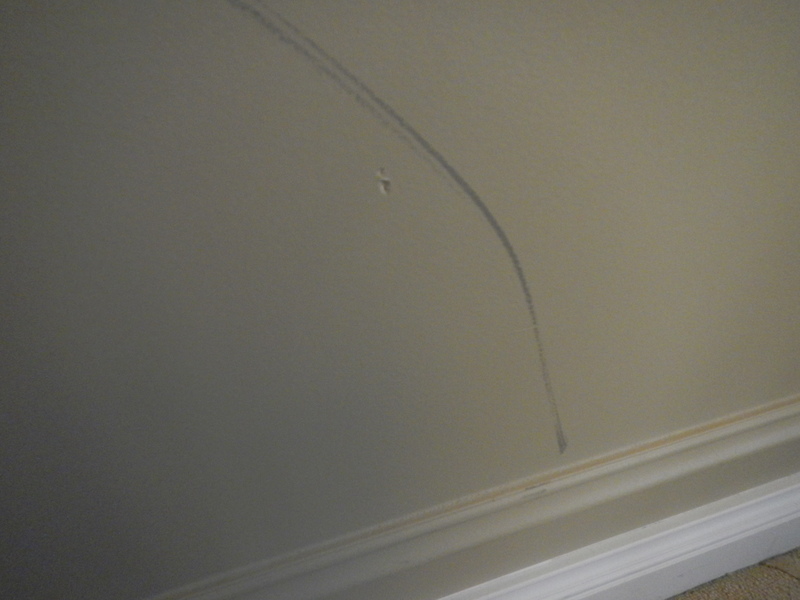 A large black mark with a big nick was also left on the wall in the living room sometime before our arrival. 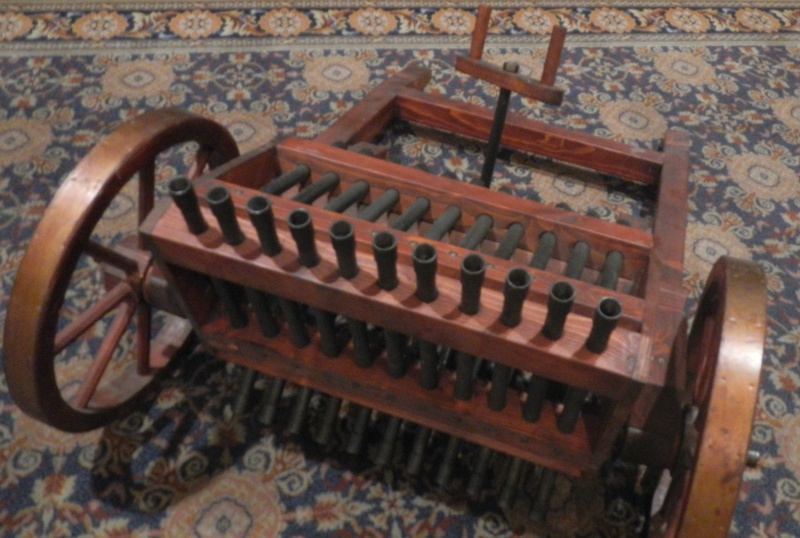 It clearly needed to be cleaned or repainted, but had not been handled by the time we checked in. The last issue I had with the room was that it had an electronic mini-fridge. A mini-bar is a rarity in a Vegas hotel room, so I appreciated the option, but was annoyed that it had electronic sensors preventing us from removing anything to keep our own beer cold. Instead we had to bring along a small collapsible cooler to fill with ice to keep our beer cold. My favorite feature of the room wasn’t even in the suite itself. Instead it was the security checking for guest key cards at the elevator. I appreciated the extra measure of security for the guests and the hotel pool area. Having this security checkpoint also kept a return journey to the front desk shorter to get a replacement key if you lost yours. We didn’t run into this issue, but I appreciated the convenience of it nonetheless. I have always considered the table limits in the 120,000-square-foot casino a little too high for my liking. I was hoping on this trip, with the economic difficulties Vegas has experienced, that would change. 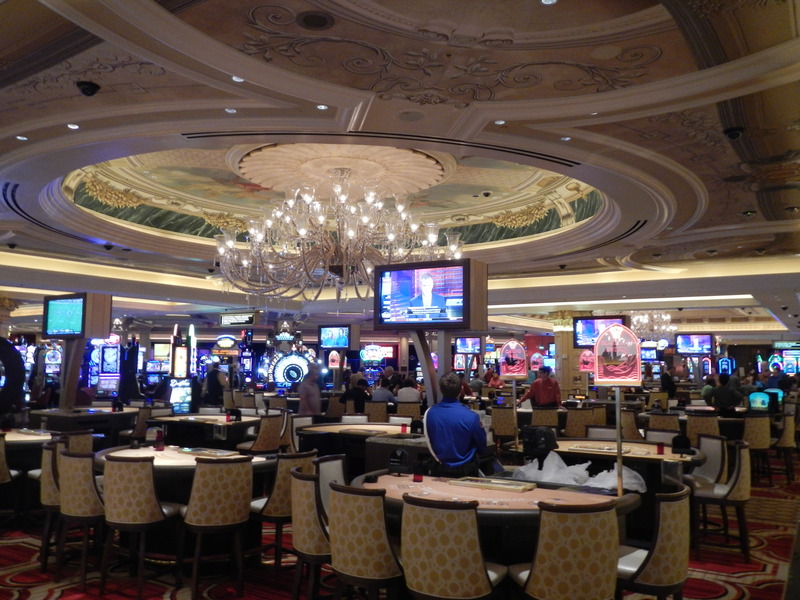 But the table limits at the Venetian are still a slight bit more than other places, but not by much. During a busy weekend on The Strip, it can be difficult to find an open spot on a game table with a limit under $25. It just so happens the Venetian has a few more of those tables than other places that aren’t nearly as nice. This made it difficult for me afford to be able to play in the hotel I was staying at, but I did manage to sneak in a couple of games when the limits were lower in the afternoon. 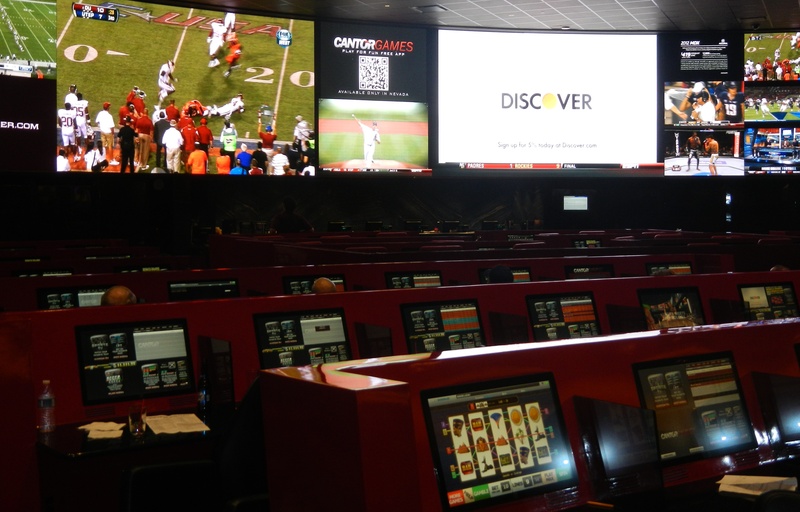 We spent a short period of time, as well – about the time it takes to finish a drink – in the sports book. I had never before entered the Venetian’s sports book. The thought to do so never crossed my mind. I always assumed it would be small and uninteresting compared to those in other hotels. But it was quite nice and comfortable with big, cushy chairs. I was surprised, and happy to relax for a while and enjoy part of one of the weekend’s football games. Across a small walkway from the sports book is the poker and tournament room, which is currently being remodeled. While speaking with one of the dealers at the blackjack tables, I was told the whole casino had been renovated, cleaning it up and making it brighter from when it first opened in 1999. And that was apparently the final part of the project. It had been so long since I had been in the Venetian that I did not recall how it once appeared, but the new look certainly did impress. It had the high-end appeal they are going for, but tastefully done, and still friendly and welcoming for guests who cannot necessarily afford the higher limits. 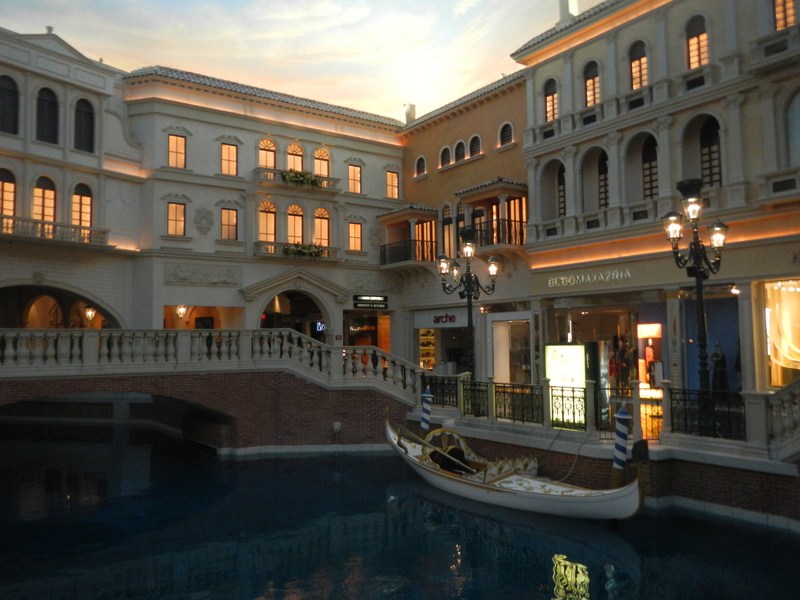 The Canal Shops area, which includes many of the restaurants as well as the gondola rides, was just as beautifully decorated in its faux-Venice style as the rest of the Venetian Resort and Casino. And as would be expected of the shops, many are high-end stores. I took the long way through the shops to leave the hotel after checking out on my final morning. We hadn’t made it a priority to shop, since we were on a guy’s weekend away, but I wanted to see it nonetheless. I enjoyed the time, particularly since there were no crowds at that hour, and would like to return to spend more time sipping a drink while spending an afternoon relaxing and people watching – one of my favorite Las Vegas activities. Other than the restaurants throughout the Canal Shops, or those in the attached neighboring Palazzo extension, there are two separate food courts. One is down at the casino level. The other is up on the same level as the shops. The eateries are generally chain or fast food-style. Included in a coupon book we received upon check-in were deals for several of the restaurants, so we took advantage of the offers a couple of different times to save money from always eating at more expensive options. Other restaurants are sprinkled throughout the hotel or in the casino. 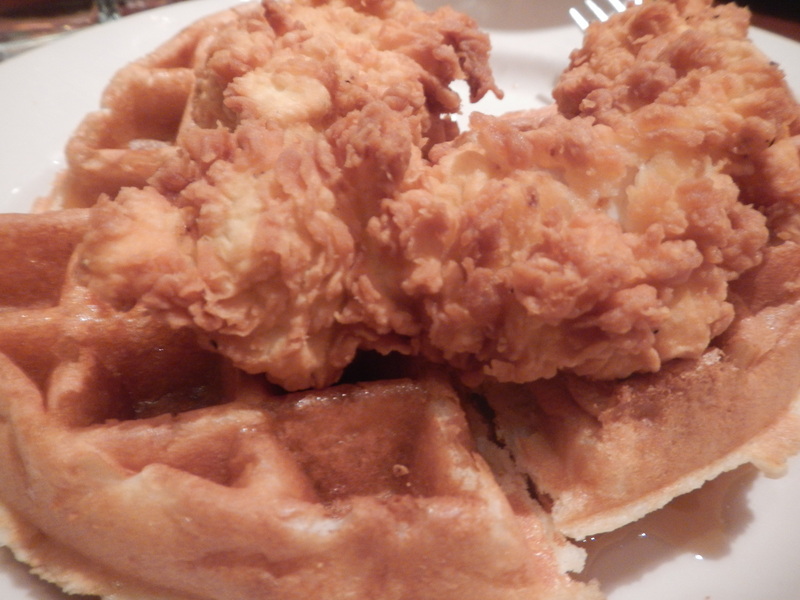 We decided to skip the fast food and splurge a little on breakfast by grabbing some fried chicken and waffles at The Grand Lux. I had eaten there for dinner years before and loved it, so I had no doubt it would be a quality option once again. It certainly was, but also a very popular one – the breakfast buffet we ordered was out of bacon when we made our trip up, so our waiter delivered a separate plate of bacon just for our table; this is one of the experiences I was referencing when talking about the great customer service we received during our stay. We were off enjoying our guy’s weekend, so we didn’t have a lot of time to do other things like shows. One thing we did make extra time to see, though, was a special exhibition on Leonardo Da Vinci. The limited engagement of Da Vinci – The Genius runs through the middle of October. Venetian Hotel guests receive a special coupon book upon check-in for deals throughout the resort, including 20% off the exhibition. I appreciated the opportunity to see the exhibit, which included the construction of many of Da Vinci’s ideas from his notebooks, as well as excellent displays on the Mona Lisa and The Last Supper, but was overall disappointed since nothing on display was actually created by Da Vinci; everything from the mastermind is considered too fragile to travel. I half expected this when going in, but still held out hope some small item may have been the gem at the end. There were plenty of other great things to see and do in the Venetian, which we didn’t have time for on this trip. The most notable option would be seeing a show, but that’s not something we’ve ever really done during a guy’s weekend to Vegas; Busta Rhymes was also in concert. We did catch part of a free 3D show put to music and projected on the side of the clock tower, though; Light of Venice has been running all summer. 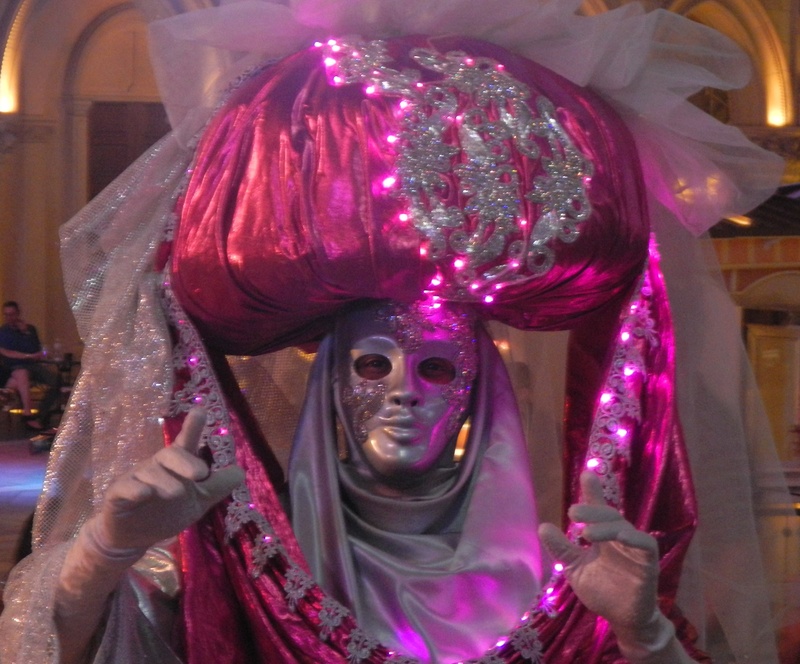 There were also strolling masquerade characters on the bridges in front of the hotel greeting guests. I found this to be a fun novelty I had not seen duplicated at other Las Vegas resorts, so I stopped for a laugh to snap a few photos. 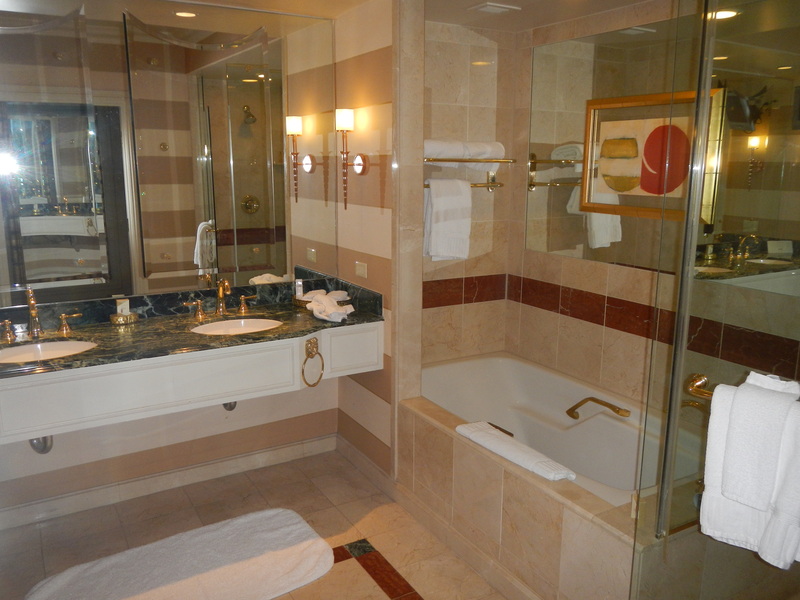 Overall I would have to say the Venetian Resort and Casino is my new favorite Las Vegas hotel. That’s saying something, too, considering I’ve stayed at approximately fifteen different hotels. And while I try not to stay anywhere twice, always experiencing a different resort on each visit, I would certainly be open to staying at the Venetian again. Sure, there were a few small issues – the delay of our bags, marks on the walls in our room – but the great customer service and the value I feel we received far exceeded any issues. And that’s something I would never have believed I would have said just a few years earlier when I had a totally different and unimpressed perspective of the property.